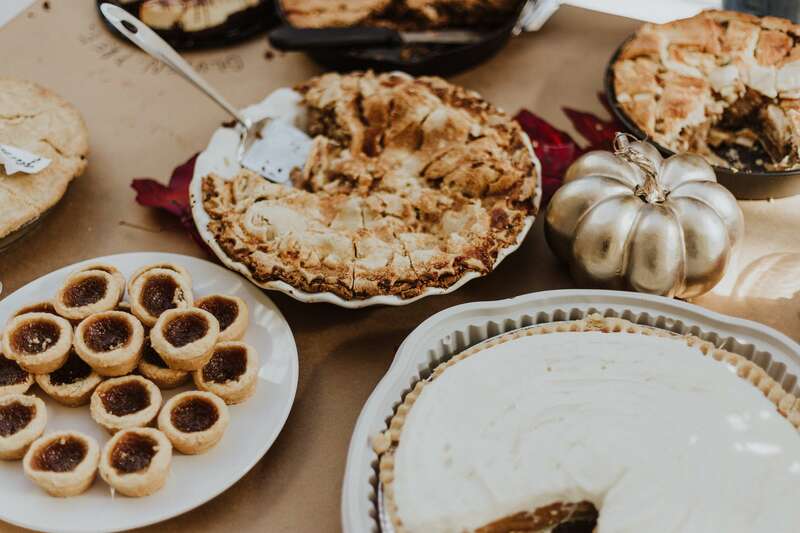 A collection of Thanksgiving snacks and treats for kids can be found below. 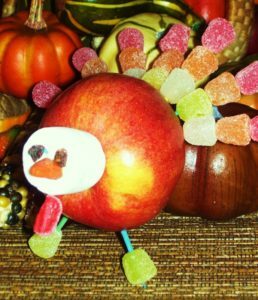 These are great treats for the classroom or for a kids Thanksgiving party. These are fun to make. The tail feathers can be colored mini-marshmallows, gumdrops or ring cereal. The feet can be whatever you decide–such as gum drops or candy corn. Put little cookies, raisins, nuts, M&M’s, and pretzels into an ice cream cone (the ones that are pointed) to make a cornucopia snack. I didn’t find it necessary–but you can use icing/frosting to hold goodies in. These would also make cute ‘Name Place’ treats. Simply write each guest’s name with a ‘food writer’ on the side of the cone! Four Pumpkin recipes here… but be sure to also visit the PUMPKIN SNACKS AND RECIPES CATEGORY! Great for Thanksgiving!!! Give each child a cup. Into their cup put a large scoop of canned pumpkin, marshmallow crème, cool whip, and pumpkin pie spices. Children then mix and spread it on graham crackers and eat. Mix all ingredients together and pour into the crust. The recipe is then ready to eat; it may be refrigerated or frozen. Soften the ice cream. Combine pumpkin and other ingredients. Fold ice-cream with pumpkin mixture. Pour into a 9″ by 13″ pan. Top with chopped nuts. Freeze overnight. This can also be put together weeks ahead. Warm at room temperature slightly before serving so pieces will easily cut. Top with whipped cream if desired. 1. Make butterscotch pudding as directed on the box, using 2 cups of milk.After it’s mixed, add 20 drops of red food coloring and 25 drops of yellow food coloring, stir and refrigerate for 30 minutes. 2. Make banana cream pudding as directed, using the last two cups of milk.Add 20 drops of yellow food coloring and refrigerate until ready to use. This one is also nice September through November! 8. MAKE SOME SUPER EASY AND YUMMY ACORNS! 1. Dip an end of the Donut Hole into your choice of spread. ( Nutella, etc.) Only dip it half way! 2. Dip the frosted end into your ‘sprinkle’ choice. This is the top of the acorn. 3. Stick the pretzel stick into the top of the acorn. This is the stem. This is great to serve as a snack or to tie up prettily in a baggie with raffia and a note explaining the symbolism of the ingredients! If you’re going to put this out in a bowl for children or guests to munch on—write the symbolic ingredients on a card and place it near the treat for all to see! One easy way to provide Thanksgiving party food for kids (or adults) is to create a huge bowl full of snack mix. Start with a box or two of your favorite snack cereal Add candy corn, raisins, small marshmallows, small pretzels, chocolate chips and other treats to the mix. In a large bowl, mix one 6-oz bag original flavor Chex Party Mix, 2 cups Wheat Chex cereal, 1 cup candy corn, 1/2 cup whole salted almonds and 1/2 cup chopped dried apples. 1. Microwave popcorn according to package directions and empty into a large bowl. Remove all unpopped kernels. 2. Stir sugar and pumpkin pie spice together in a small bowl. 3. Spray popcorn liberally with cooking spray and toss to coat evenly. Add raisins and pecans. 4. Sprinkle with sugar and spice mixture and toss until popcorn is well coated. You may also like the SNACK MIX RECIPES Category…! Lots of ideas there!!! 1. Microwave and melt 1/4 c. margarine/butter and 10 1/2 oz. of mini marshmallows for 1-2 min. 3. Grease/butter hands and form the popcorn into pumpkin-shaped balls. 4. Complete pumpkin with a green spearmint for the top stem. Ask each child to bring in a piece of fresh fruit or a can of fruit. Have them chop the fruit with a plastic knife. Mix all together in a big bowl and serve. May top with miniature marshmallows and/or add some dry vanilla pudding (or cool-whip) and shredded coconut to the fruit to make it special. The extra cans of fruit left over can be donated to a local food pantry. To stabilize the turkey body, slice a piece of melon from the bottom. Alternate cheese cubes and grapes onto long tooth picks. Put the (feathers) fruit and cheese skewers near the back of the melon. At the sides, insert red and yellow pepper strips. Insert a small pear in the front of the melon for the head. Complete the decorations using read and yellow pepper pieces and additional cheese! OK get ready for this one! The scooped out bread bowl with the dip in it– is the body of the turkey. Place the scooped out bread and put it where the turkey’s head would go. Next thread veggies on the really long toothpicks or skewers…those are the tail feathers! Improvise with veggie bits for the wattle and eye…If platter is large enough, surround this guy with additional veggie dippers. Love this one! 1. Mix orange zest with cranberry sauce. 2. Pour over the block of cream cheese. 3. Serve with veggies, crackers and pretzels. Celery is especially good with this! 2. In a 2 quart baking dish with lid, blend sugar with cranberries. Be sure to coat all berries. 3. Cover and bake for about 30 minutes, until the cranberries pop and release their liquid. 3. Remove from oven and stir in the apricot jam and pecans. 4. For best taste/results, refrigerate overnight. Attach hat tops with frosting. Cookie base can be made using ginger snaps, striped round cookies or small sugar cookies. An orange chicklet is used for the buckel. 1. Set the chocolate-striped cookies stripes down on a wax-paper-covered tray, spacing them well apart. 2. Melt the chocolate chips in a microwave or double boiler. 3. One at a time, stick a wooden toothpick into a marshmallow, dip the marshmallow into the melted chocolate, and promptly center it atop a cookie. 4. Using a second toothpick to lightly hold down the marshmallow, carefully pull out the first toothpick. Chill the hats until the chocolate sets, then pipe a yellow decorators’ frosting buckle on the front of each hat. Use a large turkey shaped cookie cutter to cut out turkey shapes from wheat bread. Spread the whole shape with peanut butter. Use a raisin for and eye, a slice of a red gummy worm for the wattle, and fruit loops for the tail feathers. 1. Using a large, turkey-shaped cookie cutter, cut cookie shapes out of toast. 2. Spread toast turkeys with peanut butter. 3. Add corn candies for feathers. 4. Add raisins for eyes. Make mini cornucopias using bugles and Trix cereal for snack. The kids can create their own by adding some peanut butter inside the bugle and then adding a few pieces of the trix. They come out cute and the kids love them! Both an activity and snack in one! Yummy for all ages! Place containers of “autumn” colored frosting, sprinkles, candy corn, and other decorations on the table. Children decorate as desired! Open one of the Oreos. The side with the filling is the base of the turkey. (Eat the other part!) Take the other cookie and stand it upright in the filling. Stick pieces of candy corn in the filling of the upright cookie for feathers and place the raisin in front of the body for the turkey’s head. Red icing or small piece of red licorice. 1. Divide the Oreo into two pieces without breaking the cookies. 2. Place four or five pieces of candy corn around the top of the Oreo cookie that has the icing. 3. Place the flat part of the Kiss in the icing at the bottom of the Oreo. Add green icing to the other half of the Oreo so the Turkey will look like it is standing up. Add a touch of red icing or a small string of red licorice to make the waddle. Eyes can be added using small pieces of icing. A fun snack using Jiffy cornbread mix…. Make dollar-sized corn pancakes from the mix; fry them on an electric skillet or griddle. Candy corn or Reeses pieces. Fill the fingers with candy corn and the thumb with popcorn. Place the ball in the palm of the bag. Glue an eye on and then twist the bag. Place cardboard feet on bottom. Don’t forget the little red waddle over the nose/beak. Option: Mold Mixture into a ball and roll the ball in broken Heath candy pieces. 1. PLACE all ingredients in large pitcher with tight-fitting lid; cover. Shake vigorously 1 minute or until well blended. Thouroughly clean out and scrape the sides of a pumpkin. 38. PUMPKIN SPICE HOT COCOA – Wonderful for November evenings! APPLE CIDER served warm or cool is the perfect beverage for a Thanksgiving gathering. To fill the room with a delicious aroma, fill a crock-pot with apple cider. Add 2 or three cinnamon sticks. Optional: Add 1/2 cup of maple syrup or orange juice. Simmer on low. Mmmmm, I can already smell it!